Hello friends. Thanks for patiently waiting for the next Christmas Past project. My dear dad passed away 10 days ago and as you can imagine, other things took priority above project work. But I'm getting back into our regular routine now and throwing myself into things that bring me joy - scrapbooking being one of those things - so I'm very happy to continue showing you how to get the most of your Christmas scrapbooking supplies. If you read my previous Christmas Past Project posts you'll remember that I am on a mission to use just a few, new and lovely products to create several Christmas themed projects! I have realized that I have SPHD (Seasonal Product Hoarding Disorder!) 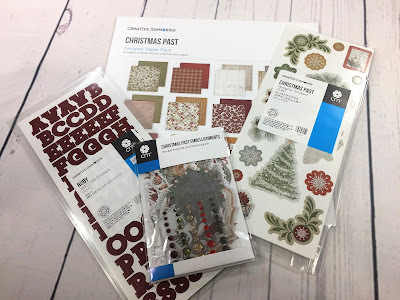 and I although I purchased the charming Christmas Past Paper, Stickers, Embellishments and the Ruby ABC/123 Letter/Number Stickers*, I am trying hard to use them all up and not have any leftovers that will add to my seasonal product stash! As part of this quest, I am sharing all my project plans with you so you too can make the most of your Christmas products. 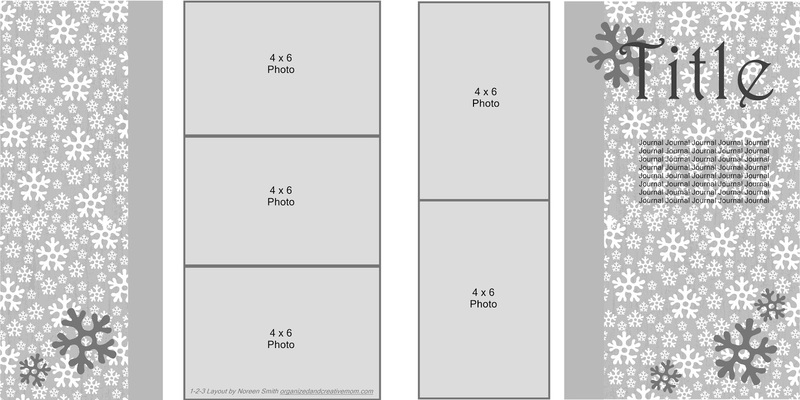 So far we've made a December Daily Album or a Christmas Countdown Project, and today I've got a new 1-2-3 layout for you! I can't tell you how gratifying it is to make and share these layouts, and I am so pleased that so many of you love using them to complete appealing layouts in a jiffy! 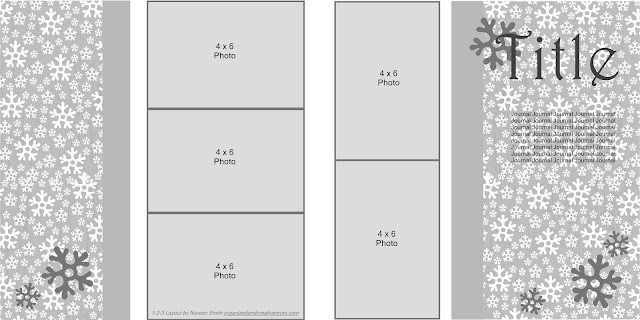 This month's layout has space for five 4" x 6" photos, and was designed specifically to use the beautiful printed paper in the Christmas Past Paper pack that features the three deer in the quiet forest. Sometimes we don't want to use papers like this because we don't want to "ruin" them, but I planned how to make the three simple cuts that will allow the paper to be used in a two-page layout without destroying the gorgeous scene! 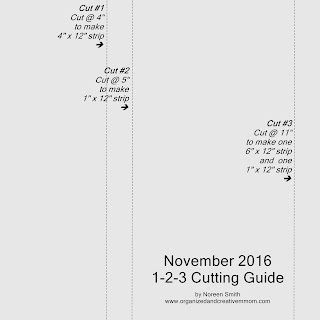 As always, you can download a FREE copy of the cutting guide and layout here, and I've made a video to show you how quickly this layout comes together. 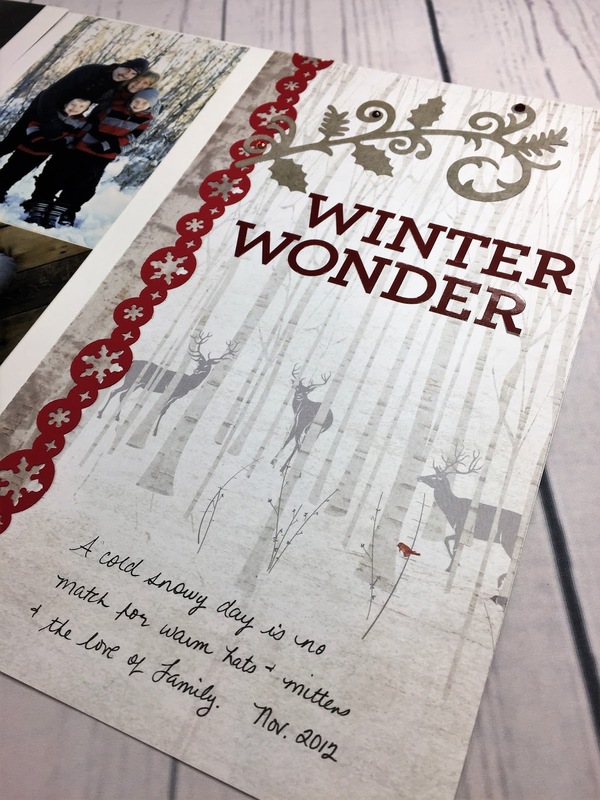 If you've already used the "deer" paper, don't dismay - I'll also show you in the video a version of the layout using a more traditional piece of double sided paper! Grab a beverage and enjoy! 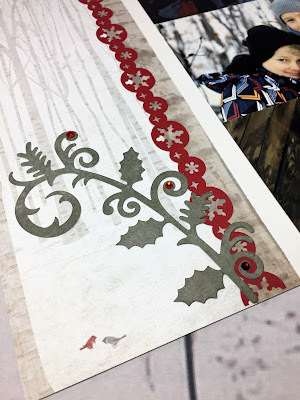 I made two border strips punched from Cranberry Cardstock using the new Snowflake Chain Border Maker Cartridge and placed them over the seam between the strips on each side of the layout. I added just two large scroll-work die-cuts and a few gems from the Embellishment pack, used the Ruby ABC/123 stickers for the title, and wrote my journaling with my Black Dual-Tip Pen. You'll notice that because of the images printed on the paper and my final placement of the embellishments, I ended up moving the title and the journaling from their original planned placement on the sketch! 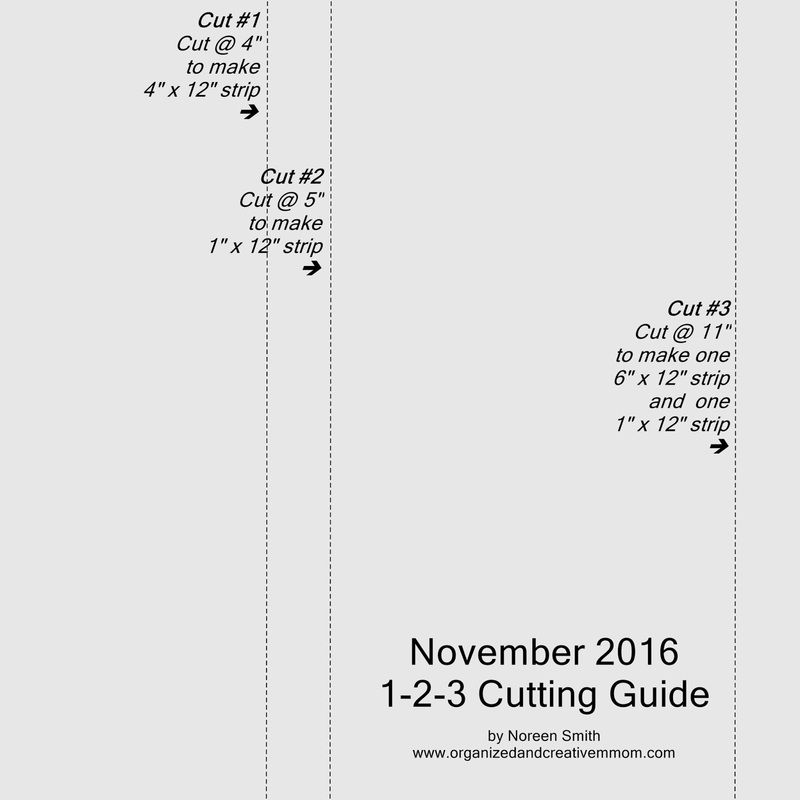 It just goes to show that you have to make adjustments where needed based on how you feel your overall layout is coming together! I'll be back in the next few days with Christmas Card Project where we'll use only two pieces of our Christmas Past Paper to make twelve gorgeous Christmas Cards! Gorgeous layout! I'm so sorry for your loss. Oh, Noreen, I'm so sorry about your dad. And I'm glad and grateful that in a spirit of mindfulness you've chosen to take actions of joyfulness and sharing. I'm really loving what you're doing with the gorgeous Christmas Past. Thank you. Bless you. Adorable, Noreen! I'm copying this right now! Adorable, Noreen! I'm copying this right now. So sorry for your loss. So sorry to hear about your Dad, Noreen. Thanks again for another one of your fabulous 1-2-3 layouts. I have used them on several of my layouts & shared them with my customers, too. Thanks again!! !